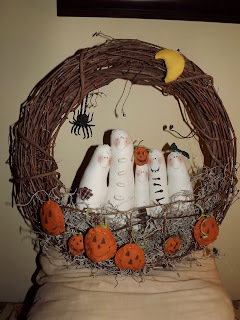 Here are the steps I took to make my ghost wreaths -- muslin ghost bodies and stitched in one piece and then top stitched to separate individual bodies. I tea stained the fabric after stuffing to give the ghosts a well-worn look. I attached some grapevine fencing to the front of the wreaths and stuffed with some moss. The ghosts were hot glued to the inside of the wreaths and let to dry completely. The pumpkins and moon are stitched and then stuffed with a little polyfil and attached to the wreath. I used a pigma pen to draw the faces on the pumpkins and then added a little stick to each pumpkin top as the stem. My die cutting machine was used to cut out each spider from felt. Love the way they look hanging from the side of the wreath! Doll and Bear Pieces and Parts!